Marcia Huyer is an installation-based artist living and working in Toronto. She received an MFA from the University of Victoria and an AOCAD from the Ontario College of Art and Design (now OCADU). Huyer has been the recipient of a SSHRC grant as well as other awards. Her work has been shown in festivals and public institutions across Canada. In 2013, she participated in a two-month residency in Sackville, New Brunswick hosted by Struts Gallery. Past exhibitions include Art Gallery of Greater Victoria, Victoria, BC; ODD Gallery, Dawson City, YK; Eastern Edge, St. Johns, NL. She has participated in Scotiabank’s Nuit Blanche, Toronto; CAKFA, Kitchener, ON and THIRD SHIFT, Saint John, NB. Her project Negotiating +/- at Conestoga Mall will be her second CAFKA project. In 2007 Marcia exhibited her inflatable sculpture Tune In, Turn On, Bleach Out at the Kitchener City Hall. Negotiating +/- consists of 160 opaque white plastic bags which inflate and deflate at various times. 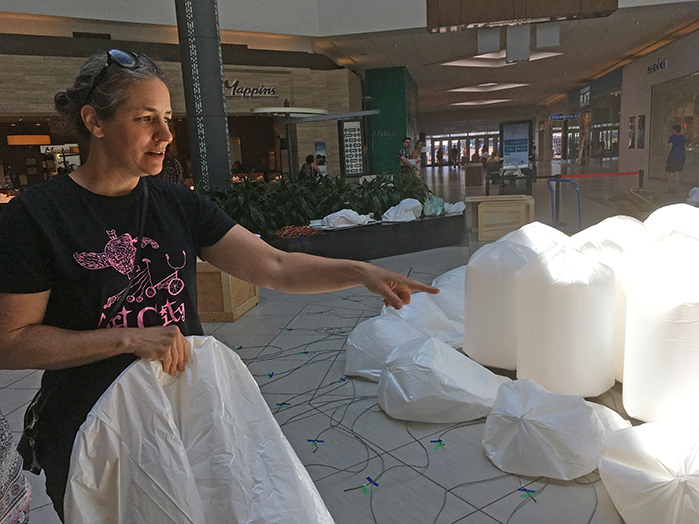 Each bag is inflated by its own fan and positioned closely together with the overall shape of the installation corresponding to the shape of the skylight above the mall intersection. There will be sufficient space surrounding the piece for the public to walk around. Every bag is attached to a circular plywood base with a fan inserted. The base sits a few inches from the ground. Each bag inflates to 40 inches high by 30 inches wide. The inflation and deflation of each component will be controlled through a micro-controller using a variety of data sets. This is similar to the controlling of an LED matrix, but rather than LED lights turning on and off the fans would turn on and off, inflating and deflating the bags in a variety of patterns and sequences. Image centre: Marcia Huyer, Tune In, Turn On, Bleach Out, Tyvek and electric blowers, Kitchener City Hall, CAFKA.07. Image bottom: Marcia Huyer, Working Sketch for Negotiating +/- .